Cupcake blogger and baker Bakerella has revealed the latest in her series of cupcake pops. The ones below were created to honor a reader of hers whose daughter had to have a liver transplant at one-years-old. You can read more about little Savannah and organ donation here. Yum! Let me be the first to say "AWESOME!!!" from the bottom of my heart. I am an procurement coordinator who just tripped upon to your page. What is a procurement coordinator? I work directly with the donor families in helping them make end of life decisions and I coordinate the entire gift of life process from start to finish. I know a little bit about organ donation and I am so impressed. Thank you, on behalf of so many, for raising awareness about organ donation! Anonymous, I know exactly what a procurement coordinator is! I work in the tissue banking field. Let me add a shameless plug for Tissue Donation. While organs are in desperate shortage nation-wide, it's just not all about organs! ;-) Tissue enhances the quality of life. 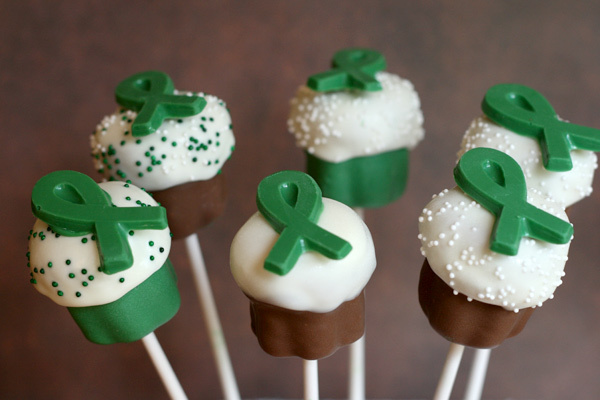 Buy a cupcake pop and support both! Thanks for raising awareness about donation. There's nothing greater or more selfless than giving the Gift of Life!